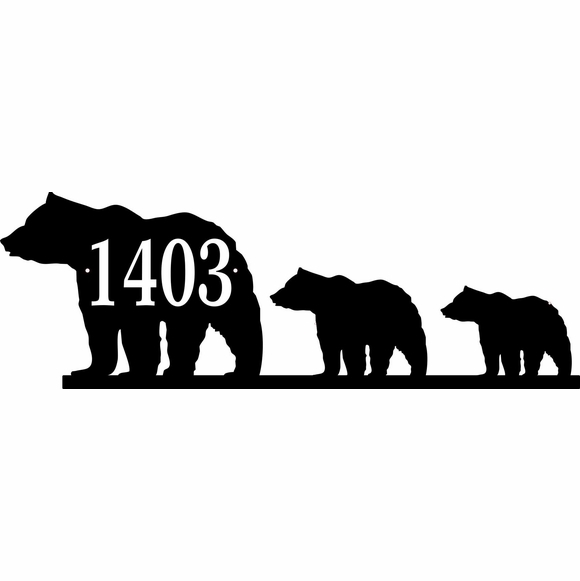 Three Bear Address Sign - - consists of a three bear family out on a walk: a large mama bear that displays your house number followed by a medium size bear, and a small bear. Wall mount. Made in USA. If your home or business is located in bear country or you're a city dweller with a soft spot for bears, then this wilderness theme three bear silhouette sign is the one you want for your home or office building. The three silhouette figures are joined along the bottom edge with a molding approximately 5/8" wide to hold the three pieces in position. Includes one line of personalization with up to four (4) 3" characters. Nine amazing color combinations: sky blue with white characters; black with white characters; black with gold characters; white with black characters; brushed gold with black characters; brushed stainless with black characters; kelley green with white characters; red with white characters; and yellow with black characters. Dimensions: 23.5"W x 8"H x 1/8". Note: when you order this address plaque in white with black characters, it looks like a Polar Bear as shown in first small image above.